The Re-Invention of Jeannie Clinton – Page 2 – Jeannie Clinton's blog is about documenting what one goes through when change happens. Jeannie is a teaching artist who brings Theatre down to is Core. Don't let reality dictate your dreams. Make your dreams a reality! Day 3 : Should I or Shouldn’t I? Day 2 of Alice Madness! Day 2 of Alice in Wonderland Jr. Madness has just finished! We had another very productive day. We had the rare opportunity to take a trip to the University of Rochester’s Rush Rhees library where they are holding an exhibit : Alice in the Looking Glass: Illustrations and Artists Books from 1865-2012. (Open now until August 16) Since we are going to the exhibit in shifts; actors, costumers, property builders, set builders, advertising and marketers and theatre techs, by tomorrow, will have completed the opportunity to become a Theatre Dramaturge. (One who researches theatre.) The Collector, Mrs. Jeanne Harper, explained to the kids why she was so interested in the book and what her collection means to her. Her collection was extensive and she was so pleased that the kids were able to visit! What great timing!! 1) Actors: By looking at these illustrations- what can you use to help your character development- how would you hold your body? Is there something you saw that can help you on stage? 2) Costumers/Make Up: Are there any elements that you would possibly add to an existing costume to make the character seem more like one of the examples you saw in one of the Illustrations? Would it be interesting hair style or Make up choice? 3) Properties: Were there any elements that you thought were interesting? And how would you put them on the stage…. 5) Tech: What lighting design would you choose? Technical theatre is creative too! Think about it! 6) Advertising: How would you advertise the show? Based upon what you saw today, is there something that you would like to do to the bulletin board outside the theatre to draw more people in? 6) Everyone: How did you like the visit? Would you re-read the book if you haven’t already? What was thrilling for me was to see the kids make connections with what they saw in the exhibit to what they were doing on stage. And now my students are fully engaged in the process of theatre! WOOT! I can’t wait to read their comments: which should be in the comment section of this blog post. After our visit, we did another run through, worked with our props and our builders are starting to bring the bare stage alive! The drop was hung and additional trees and mushroom painted. Props crew got the boat painted and built. The bulletin board outside was sketched and painted and the tech crew got mics on and ran lighting cues.As the Mad Hatter Says in our show… ” I want you to LIVE! I Command you to LIIIIVVVE! 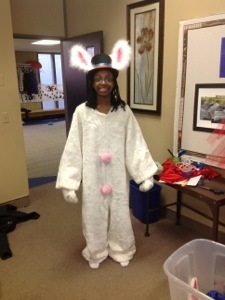 !” Alice in Wonderland is starting to come alive! How did day one fair? Quite successfully I may say! Day 1 equated to students and faculty members worked on completing costumes, props, bulletin boards, set pieces and hung black lights for one of our scenes and our drop arrived! Actors ran through various scenes and worked some of the props that have been created. There was a lot of re-spacing. Things change in the space now that some of the set is now being installed, so re-spacing is a necessity! It was a VERY busy, busy day but a lot was accomplished! It is all starting to come together! It is only going to get better and better as the days go on! Today begins one of the busiest and productive times in out Middle School- Show week! We are blessed that we have the opportunity to work on the Middle School show, Alice in Wonderland Jr., during the course of our school day- it is our way of working together as an entire Middle School community for one collective goal. You will see lots of things happening this week- actors trying on costumes, the set going up on stage, out bulletin board getting put up outside our theatre, props being put on prop tables on stage, and lights being hung and programmed. Everything comes together this week. It is crazy but it amazes me at the same time. I am amazed that the entire group of middle schoolers come and work together. In this process kids are not divided by grade, they make a choice of what they would like to explore in the area of Theatre. They are mixed up in different grades and help each other out. When the Cast and crew take their bow at the end of the show, you realized that every Middle Schooler at Allendale Columbia School has done something to make the show happen. It is a sight to see! I am amazed but not surprised! And I am forever grateful to my colleagues, who only do this once a year, yet are enthusiastic to help with this huge task that makes us different from other schools. The buzz will be in the Middle School this week! Stay tuned! There is something magical when you have Middle School kids who want and who are willing to help other kids who are their same age around the world. During a time when they are trying to create their own identity, my students want to help others. Not because it is a service learning project that our school, Allendale Columbia School, wanted to take on, but because it was the right thing to do. As part of the Filipino community in Rochester, I am often involved with many different types of community service. Four years ago it was helping the people of the Philippines as they were trying to recover from Typhoon Ondoy. At that time, I presented to the middle school an opportunity to collect supplies such as food and vitamins. We did this successfully and sent over 500 pounds of food over seas. I had made a connection with the Vice Principal of the Neptali Gonzales High School in Mandaluyong City. It is a school just outside of Manila and one of the poorest districts in Luzon. Families struggle to send their kids to school ($9.00/year) and often they don’t have food. We were asked if we could help again. This time with school supplies old textbooks, paper, pens, art supplies, and music because it could help more people. We made a difference then, we can make a difference now. The kids and school at large have been going through their classrooms looking for things they don’t use anymore. Teachers are looking for reading material that they no longer use in their classrooms and bringing them to the collection spot. Supplies gathered from Jan. through end of Feb.
We have boxed up the first packages (3 large and heavy boxes) of out of date science and math books. We have sent along reading books of popular American favorites that we have read and don’t need anymore to update their library. We will be Skyping with the students soon. My students will be able to interact with the kids they are helping and seeing first hand, through technology, that they can make a difference. It is our hope that we can figure out a way to track the boxes and follow their journey from Rochester to the Philippines. We are still collecting more supplies and have added backpacks to our list. Our goal is to complete this years supply drive at the end of March. It makes me feel so proud to know that we are able to help and the kids wanted to help. My mother reminded me that she used to do laundry just so she could have a pencil for school. It is just a small reminder to help me realize how lucky I am. And from this experience, I hope our students know as well. Can Theatre Arts Create a Successful 21st Century Student? In education, the big buzz and focus is how to create the 21st century student. Teachers are asked to teach students who will be prepared. As a theatre arts specialist, I have to ask myself the following questions: what is a 21st century student? How do I create curriculum to satisfy the needs of my students while still maintaining the needs of the school and program? Theatre arts are a prime example of how a 21st century student can succeed. If you think of all of the parts that put on a “show,” musical or not, students hone in on their critical thinking skills in a creative way. Educational professionals talk about how the two programs of STEM and STEAM are the new wave of education and wonder how we can put these programs into schools. If the school has a theatre arts program, they have not only a STEM programs their school already but they have STEAM where the arts element is added in. Technology is incorporated with the usage of programming the lighting board so that the lights go on when they need too during the show. How and when do they program the soundboard, so that kids are heard effectively? Students are learning digital design by formatting the playbill and posters that will be put out into the community. Sometimes kids get creative with the sets and create stop motion animation as part of the set. Engineering takes on many different forms in Theatric Arts. The definition of engineering is “the art of science of making practical application of the knowledge of pure science as in construction” (dictionary.com) Students take into the account of what they have learned in the sciences and in mathematics and science and apply them to the scope of the show. Engineering applies to creating props, set, sound and lighting design, costumes and character. Art in Theatre arts is a very broad term. In all categories creation is going on. Students want to make their contribution to the process a success therefore students put forth a great deal of effort. It is great to see their pride in their work once they have completed their task. Mathematics is taken into account when designing and building a set, creating costumes- what angle do I need to cut this and to what scale? How do I put it together? All of these skills are done by using practical applications that students DO. It isn’t about sitting in a classroom. It is about doing. Now throw in some history: when was the play written, what do we need to do to make this play/musical historically correct? When students are “on the stage” they must research character. As I watch our entire Middle School work on our annual musical, I see these all of these elements work together. They have no idea that a STEAM curriculum is at work. They are learning by doing, they are collaborating with each other, they are “getting their hands dirty” and they are having fun in the process. When the teacher becomes the student. Jeannie Hines-Clinton is a professional actress and a Theatre Educational Specialist. She has been an educator in the Theatre Arts grades K-12 for 10 years.